Versatile Blogger Award, Woot Woot!! Wanna hear some fabulous news? 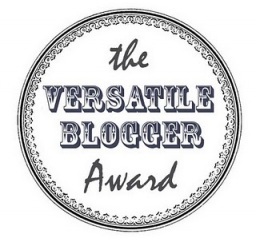 B over at Feeling Bloggy nominated me for the Versatile Blogger Award!!!!! How awesome & sweet is that?! Way awesome & way sweet! I know this is a small victory in the grande scheme of things in the blogging world, but hey you gotta start somewhere right?! First head over and show some love to B at Feeling Bloggy for nominating yours truly! Let’s face it that is so not.hard! I love you guys and love sharing my life with you. 1. I can be either the worlds most productive person or the worlds laziest person! I might take an entire weekend and clean every single inch of the house or not clean for two weeks! It depends on my mood. 3. As long as its not 20 below zero outside I absolutely love the outdoors! I could sit outside soaking up the sun, listening to the birds while reading a good book every.single.day of my life. 4. I have a slight coffee addiction. 5. I want to adopt a child. This has been on my heart for many years and the more I develop my Christianity the heavier these messages have been tugging at my heart. Little signs and feeling here and there, giving me hope! I haven’t figured out all of the details yet but I know one day we’re destined to make our family bigger. 6. I tend to over use exclamation points! I try to scale back on them as much as possible, I really do, but sometimes I’m just a happy, peppy, full of life person. 7. I also have a slight obsession with vacuuming. As in I will vaccuum our house at the mere sight of a speck of a crumb and I absolutely love the noise the vaccuum makes while it’s sucking up things from the floor! Vacuuming is probably my favorite part of “cleaning” our house. I also have a slight obsession with brushing my teeth- but that’s for another post! Well thanks for listening and hanging in there with me! 1. nominate up to 15 fellow bloggers who are relatively new to blogging. 4. thank the blogger who has nominated you in a blog post back to their link.